Aired: Sep 06, 2018 to ? Haruka Hoshinogawa, a fifth grade student who, once in her childhood, made a wish with the town's old Cherry Blossom tree with her grandfather. As she grew up, she treasured the Cherry Blossom Ribbon that was given to her by her grandfather while starting fifth grade in her school. One day, upon noting that the old cherry blossom tree is wilting, her grandfather decided to leave the shop to explore the world and let Haruka take care of the store in his absence. The next day while sleeping after taking care of the shop. her treasured ribbon sprouted a strange egg, revealing a Cocotama, a god born from an object that has been cherished with love and care. 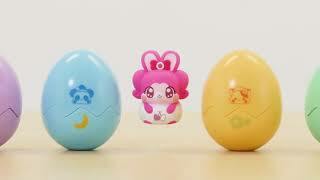 Haruka woke up and accidentally saw the Cocotama on the table, confused while the Cocotama retreated to her Hiding Egg. As Haruka picked it up, it started resonating and Ribbon's hiding egg has changed into a mysterious key. Now left with questions, the cocotama introduced herself as Ribbon, the Ribbon Goddess and Haruka learned about the existence of her kind and the mysteries behind the strange key she had. Ribbon realized that the key is actually the Key of Wonders and that Haruka was chosen by it to be the Legendary Contractor after it materialized. Now, both of them try to run the shop and meet new Cocotama friends, while discovering the mysteries and powers behind the Key of Wonders.